The New York Knicks have worked out a trade that will see All-Star forward Carmelo Anthony join the Oklahoma City Thunder. 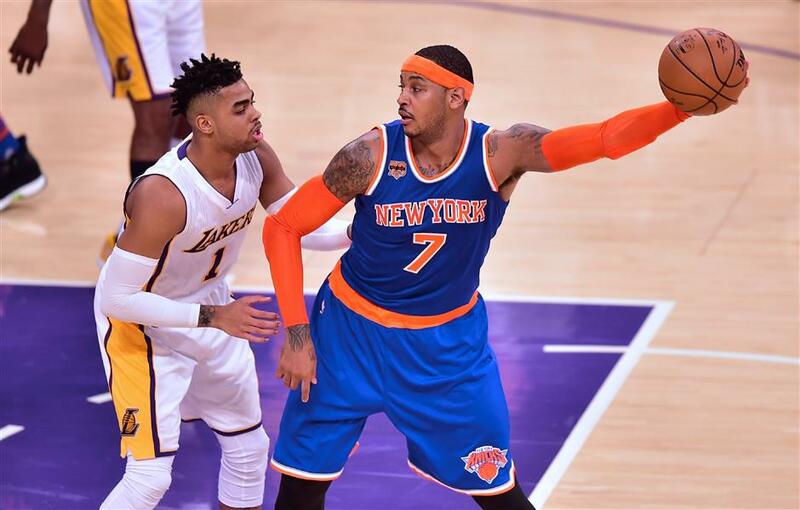 Carmelo Anthony of the New York Knicks looking to pass under pressure from D'Angelo Russell of the Los Angeles Lakers during their NBA match in Los Angeles, California, in this December 10, 2016, photo. Anthony is poised to join the Oklahoma City Thunder in a deal which will send two players heading the other way, reports said on September 23, 2017. Carmelo Anthony won't be at Knicks training camp after all. He'll be in Oklahoma City, joining Russell Westbrook and Paul George in a loaded lineup. The Knicks agreed to trade Anthony to the Thunder on Saturday, saving themselves a potentially awkward reunion next week with the player they'd been trying to deal since last season. New York will get Enes Kanter, Doug McDermott and a draft pick, a person with knowledge of the deal said. The person spoke on condition of anonymity because the trade had not been announced. The Knicks had said just a day earlier that they expected Anthony to be there when they reported for camp on Monday. But it was clear they didn't want him anymore and he no longer wanted to be in New York, where he arrived with so much hype that was never fulfilled in February 2011. He rarely had a championship core around him in New York but jumps right into one in Oklahoma City along with Westbrook, the NBA MVP, and fellow All-Star George, who was acquired from Indiana this summer. Anthony will see his old teammates soon: The Knicks open the regular season at Oklahoma City on October 19. Anthony agreed to waive his no-trade clause to complete the deal, which was first reported by The Vertical. Phil Jackson spent the latter part of his time in New York making it clear he wanted to move Anthony. But a deal was difficult because the 33-year-old forward has two years and about US$54 million left on his contract, along with the ability to decline any trade. After making the postseason each of his first 10 seasons, he has been on the sidelines the last four years and said at the end of last season his priority was a chance to win. He wouldn't have that in New York, where the Knicks are emphasizing youth and have little proven talent with which to surround Anthony. But he is close with Westbrook and George and should fit in nicely. He can possibly settle into the spot-up shooter role he's played in the Olympics, where he's won a record three gold medals and is the career scoring leader for the United States men. The trade ends an unfulfilling 6 1/2-year run in New York for Anthony, where he could never shake his reputation of an elite scorer who can't carry a team to a ring. The Knicks made the playoffs his first three seasons and reached the second round in 2013, when Anthony led the league with 28.7 points per game. But after that they never seriously proved they could do anything consistently beyond make headlines. And Anthony was right in the middle of that, with constant trade speculation after Jackson's criticism of Anthony's game. Jackson and the Knicks parted ways in June and though the Knicks kept looking, team president Steve Mills and general manager Scott Perry told Anthony they wouldn't accept a trade that would hinder their plans to rebuild through youth. It didn't help that Anthony had told the Knicks he would accept trades only to Houston and Cleveland, but a deal was finally found when he agreed to add Oklahoma City to his list of destinations. Anthony moved into the top 25 on the NBA's career scoring list last season, and maybe the Thunder can help him reach elusive team success. Jackson noted that the Knicks hadn't been able to win with Anthony, though one division title and three playoff berths give Anthony the best resume of anyone who played for the team in the 21st century. He had higher aspirations when he began pushing Denver to trade him to New York in 2010. But the Knicks gave up much of their young talent and future assets to get him, hindering their ability to fortify the team around their leading scorer in recent years. Anthony averaged 22.4 points last season and made his 10th All-Star Game, though that was the second straight season he finished well off his career average of 24.8 per game. Kanter, a 6-foot-11 center from Turkey who was the third pick of the 2011 draft, has averaged 11.3 points for Utah and the Thunder. He posted a video thanking the Oklahoma City community and imploring the Thunder to beat Golden State. "It's a new adventure for me. New York, so please pray for me," he said. McDermott has averaged 8.0 points and will be playing for his third team since being selected with the No. 11 pick in 2014.